We bought this beautiful and elegant shelf to hang in our bathroom and it looks higher-end than the price! Easy to hang and sturdy once up. Great value and looks perfect in our space. 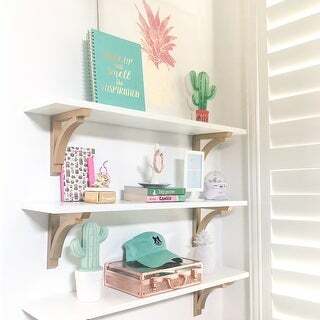 The Kate and Laurel - Corblynd wall shelf is an easy way to feature your cherished possessions, mementos, and collectibles. 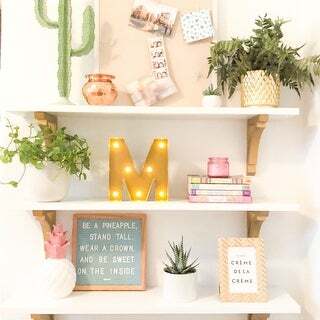 Display your home accents in groupings placed either directly on the shelf or use an exciting book or colorful pedestal as a perch on the shelf to create a compelling motif. Well-placed shelves can be so versatile in adding space to a room. Hate that clutter on your nightstand? Install shelving above the area to take your organization to the next level. This shelf is a classic, traditional design which works with most home decors and will add a dimension of finesse to a bathroom, hallway or even a kitchen. It is made of a light wooden material. The wooden brackets are a casual, curved style. A recessed keyhole hanging system is installed on both sides for a secure and even fit against a wall. Dimensions 8.0 In. X 24.0 In. X 8.8 In. Option: Satin - white, gold - 36"
These shelves are perfect in my daughter's bedroom. They are sturdy and solid. I love how the gold brackets pop against the white shelf. I ordered 12 of these shelves and they all look great! I had them installed professionally and he said the installation hardware was good. Very nice shelf and classy. Looks very well made as you know some of these wall shelves generally do not look like it's been manufactured with care. Installed it fairly quickly and sits right against the wall. Give great detail and go rid of a big furniture piece and replaced it with this light (but strong) and airy shelf. 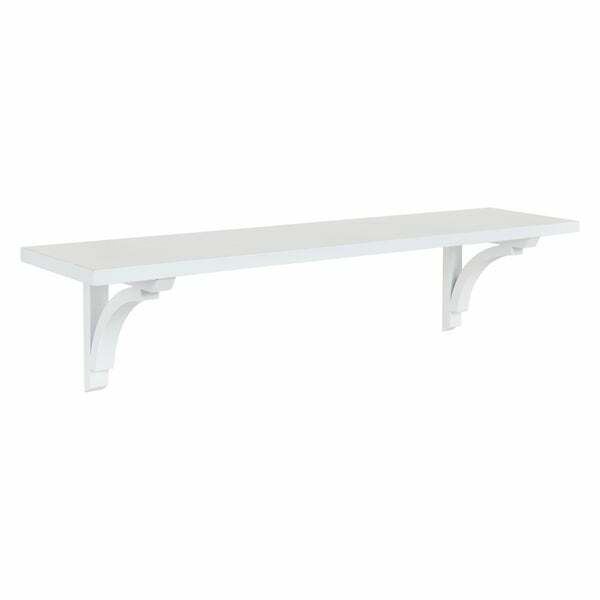 Option: White, Gray - 36"
Great shelf! Works very well above my stove. Sturdy when installed properly. (easy to do) I would not put tons of weight on it. My use was for some towels and decoration type item in my bathroom. Gray and white colors are good. All came in good condition. Option: Black - 24" | White - 24"
I am handicapped when yielding a hammer. But even I could put together these shelves. OK I had to use a philips screw driver, but very easy. I got the white and black, I really like the finish. The shelf is and nicely made. Unfortunately I couldn’t get it to fit in my space as anticipated. The white and gold is a beautiful contrast and super disappointed that it turned out to be a bit too big! 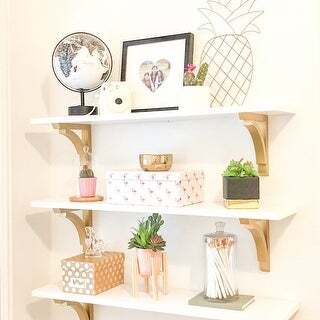 Beautiful shelves! They look perfect in my kitchen! Option: white, gold - 24"
When the shelf arrived and we took it out of the package, was packed well, first thing we noticed was a very foul chemical smell. We have it set aside to air out and off gas but may have to be returned. My husband made mention there was something stAted in the paperwork about formaldehyde. Just why? It's an ok standard shelf that stinks like chemicals that may go back. What can I say? Look good. Holes line up well. Good for small spaces. Looks just as pictured. Sturdy and well built. Very nice quality. Went up easily and looks beautiful in my kitchen holding clear containers from IKEA for dry goods. "How much weight can this hold?"